The overflowing farmer's markets in NYC are a sure sign that its time to get pickling. If all my cookbooks had a contest to see who was the most fun, Karen Solomon’s jam it, pickle it, cure it and other cooking projects would win hands-down. Some of her cooking endeavors are complicated and time-consuming. This one is quick and easy, so easy a child can do it. In fact, I’ve made these pickles with children, and they think its a blast. Solomon recommends garnishing a Bloody Mary with these green beans (skip this step if you are making them with children). They also make a great topping to a salad. You can substitute other vegetables as well: I’ve made pickled carrots, beets, cauliflower, and cucumbers. This recipe is a keeper. You’ll need 3 clean pint jars with lids. 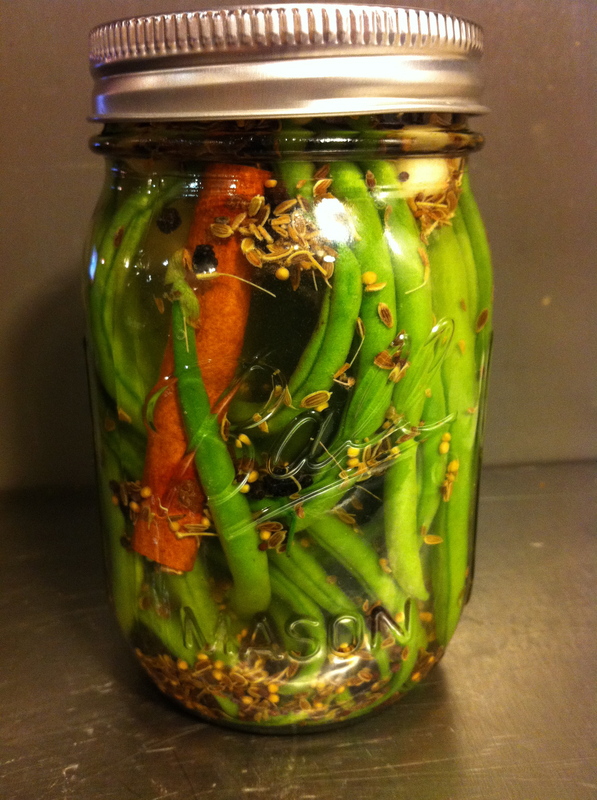 Or if you only have a few green beans, cut the recipe in thirds and make one jar. I just stuck this batch in the fridge, so I did not need to obsess about readying my equipment and keeping a sterile laboratory-type environment. I’ll post more on canning another time. For now, here’s an amazingly easy recipe to try. Add one third of the green beans, garlic, spices and salt to each jar. Fill each halfway with vinegar (about 1/2 to 3/4 cups). Top off each jar with cool water. Seal each jar with a lid, and shake gently to dissolve the salt and distribute the spices. Refrigerate for at least 3 days. The green beans will be ready to eat in 3 days, but will taste the best in 2 weeks. They should stay good in the fridge for about 1 month.